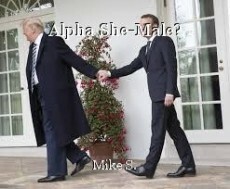 Alpha She-Male?, poem by Mike S.
a secret alpha-she-male, that's my best guesser. Why not just hump their leg, if you know what I mean? Under his watch, we've fallen so far. Stroking world leaders--get a room! No mincing words here, Mike. Nice one! Thank you, and that scene was totally embarrassing! imagine this , buddy boy .